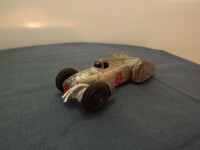 This model is the Dinky 23d-G-8 Auto Union Racing Car in Silver with silver #2 racing numbers on a red background. 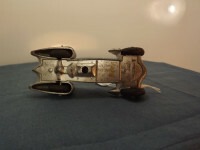 The model features a cast body with open front wheels. At the front the radiator (grille) is painted red and on each side it carries a red, circular racing number panel with silver #2 in the centre. The baseplate is silver painted pressed metal. It is marked with "Dinky Toys" at the front (just behind the front axle, "Made in England by Meccano Ltd" in a block of three lines just to the rear of this, and "Auto Union" at the rear (just behind the rear axle). 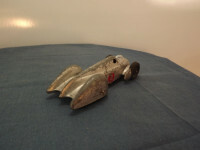 It also carries a rudimentary representation of the engine sump, gearbox and rear differential. It appears to be press fitted over locating pins, front and rear. All wheels consist of cast black hubs with black rubber tyres with the wishbone pattern. The steel axles are crimped on all four ends. 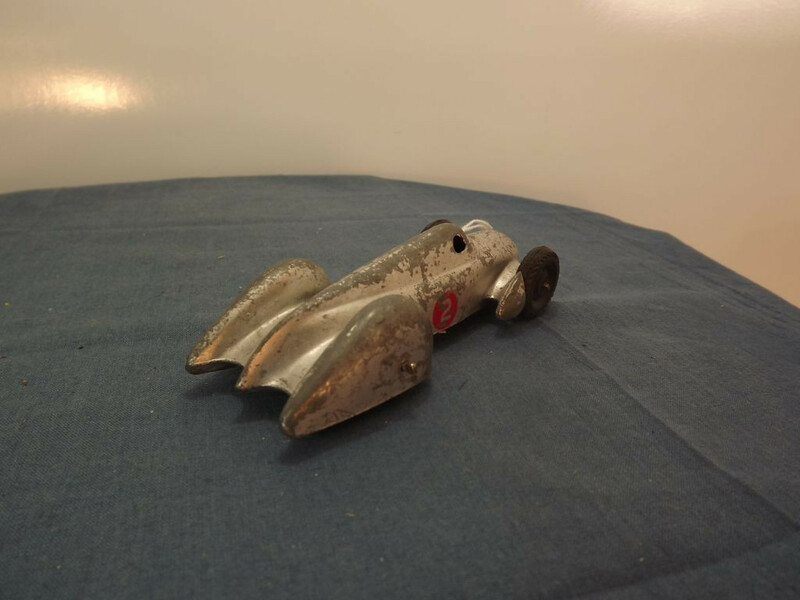 This model was issued between 1948 and 1950.